Wilmette (population: 27,700) is located 14 miles north of downtown Chicago in Cook County along Lake Michigan. The community is among a group of suburbs that are part of an affluent area called the North Shore that serve as bedroom communities to the residents who live there while commuting to Chicago for work. The community's name comes from Antoine Ouilmette, who was a French-Canadian fur trader that married Archange, the daughter of Potawatomi Indian chief Sauganash. The trader was instrumental in getting many Native Americans that lived in the area to sign the Treaty of Prairie du Chien in 1829, which they agreed to vacate their lands in present-day Wilmette and Evanston. Ouilmette was awarded 1,280 acres of that land in the same year that the treaty was signed. He would later sell the land to farmers and developers in 1848, and a pair of communities were formed under the names Gross Point and Wilmette. The latter would be incorporated in 1872, while the former was annexed to Wilmette two years later. On an interesting note, Evanston was nearly annexed to Wilmette in 1894, but the voters said no at the polls by just three votes! Wilmette can be reached by taking the Chicago & Milwaukee Railroad into town, or by traveling along the lake on Sheridan Road, or further inside the city on Ridge, Green Bay, or Wilmette Roads. US 41 and Interstate 94 pass a couple of miles to the west. Mallinckrodt High School was open for business as a centralized girls' high school in the Archdiocese of Chicago in September 1923 by the Sisters of Christian Charity, which had opened up Maria Immaculata Academy in 1915 in the same location for those girls who were considering or had already decided to join the religious community, which had opened their location in 1915 after moving their motherhouse from Wilkes Barre, Pennsylvania. The name Mallinckrodt comes from the founder of Sisters of Christian Charity, Pauline von Mallinckrodt, who was a daughter of a wealthy member of the German government. Mother Pauline (as she was known) also set up schools, day care centers, and hospice care in Germany before coming to the United States in the 1870's. There have been steps taken to have her considered for sainthood in the Roman Catholic Church, and in 1985, she was given the title of Blessed Pauline by Pope John Paul II. In researching the school, we received the following information from Sr. Anastasia, who serves as the assistant archivist for the Sisters of Christian Charity's Western Province location in North America at Wilmette (www.sccwilmette.org). This came from a yearly record that was kept on Mallinckrodt High School by the convent. "Ever since the establishment of Maria Immaculata Convent, the Motherhouse of the Sisters of Christian Charity, at Wilmette, more or less frequent applications have been made for private and class lessons in various subjects. Music lessons, as well as private and class lessons in sewing have been given since the beginning of 1917. In one or the other instance private instruction was given in academic and commercial subjects. However, this arrangement did not prove practicable, and therefore it was discontinued. There is no central Catholic high school for girls between the Immaculata High School on Irving Park Boulevard, Chicago, and the Holy Child High School at Waukegan. St. Scholastica’s Academy and Marywood School at Evanston are boarding schools taking a high tuition, and therefore making it practically necessary for a large percentage of the girls desiring high school education to attend the public high schools. In the spring of 1923 the need for a central Catholic Girls’ High School for the North Shore district began to be emphasized….On the evening of May 10, Monsignor Kelley in company with Rev. F. Siedenburg, SJ, called at the Motherhouse saying he had been delegated by the pastors of the surrounding parishes to ask whether we might be willing to conduct the high school. …Mother Hyacinth had anticipated the situation, and had previously asked and received from Reverend Mother General permission to open a high school in the north wing of the Motherhouse. …it was further decided to open with but two years of the high school course, the third and fourth years to be added in 1924 and 1925 respectively. On June 10 it was published in the churches of the territory involved that instructions from the Chancery ordered the announcement of the opening of Mallinckrodt High School for Girls in September; parents were urged to send their daughters to this school which promised to be the best high school on the North Shore, if not in Chicago. Arrangements were made immediately to accommodate pupils of the I. and II. Year High School as well as of the first year of a two-year Commercial Course. The Sewing and Music Departments were opened October 17th. [there was a further note under “Rates” that stated the fee for Sewing (if taken exclusive of the Regular Course), and a further note added: All Regular Students are encouraged to make Sewing an elective. If taken as such there is no additional charge. UNIFORMS: On November 12, the students wore their uniforms for the first time. The Winter Uniform is a one-piece box plaited [sic] dress made of French navy blue serge, opening at the shoulders, to be slipped on over the head. Round neck and square yoke bound with black silk braid. Inlaid pocket. Belt made of same material as dress, 2 buttons in front. The whole set off prettily with white collar and cuffs edged with tatting. A long black silk tie. The Summer Uniform is an Alice blue with tan collar and cuffs; otherwise similar to winter uniform. Monday, June 15, 1925 witnessed the graduation of twelve Commercial students, the first to leave our school. Since it had been planned that the first public commencement exercises should mark the graduation of the first High School class and entertainment was given in honor of the Commercial graduates. May 27, 1926 witnessed the graduation of the second class of Commercial students to leave The Mallinckrodt. There were twelve graduates. One of the graduates of this first class – Florence Faber – is now known as Sister Pierre Faber. She will be 100 years old in March, 2008, and lives at Sacred Heart Convent, Wilmette." 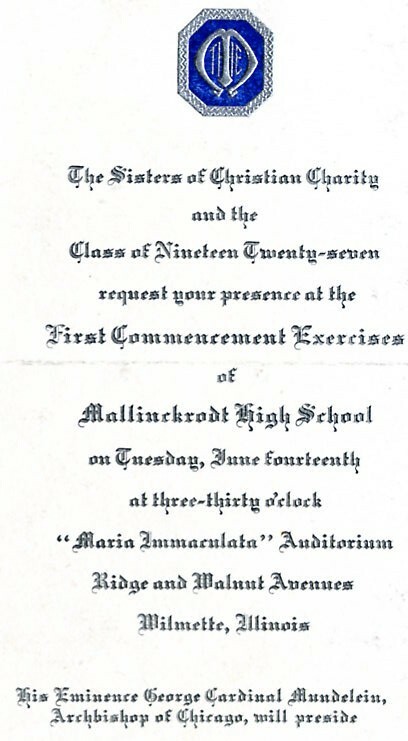 Part of a transcript from a meeting states the reason for the closing of Mallinckrodt High School (in 1960): "Since Mallinckrodt High School was originally opened only in response to the request of Cardinal Mundelein to provide a high school for girls in the North Shore area, and since this need no longer exists [Regina Dominican H.S. had been built a half-mile distant from MHS] and since our aspirancy has grown to the extent that school and living conditions on the novitiate side are over-crowded, it was decided definitely to close the day school for girls in a year or two. This will free the Mallinckrodt classrooms for our aspirants and make it possible to expand our Mallinckrodt College facilities." The Mallinckrodt building is still intact today and even used as condominums that are called "Mallinckrodt in the Park." Arithmetic Comm. Arith. Stenography Stenography Comm. Arith. Business English Business English Foreign Lang. Foreign Lang. Business Eng. Students also had their choice of activities to participate in at Mallinckrodt. A look at the school's 1927 yearbook indicates the following photos: School Basketball team, Senior-Junior Basketball, Sophomore Basketball, Freshmen Basketball, Freshmen Volleyball, Dramatic Club, the Mission Unit, the Music Club, the Glee Club, the “Y” Club [organized among the Seniors for social purposes – dances, playing cards, etc. ], and Literary Club. Mallinckrodt competed in the Catholic High School Girls' Basketball League from 1927-31, according to Robert Pruter. 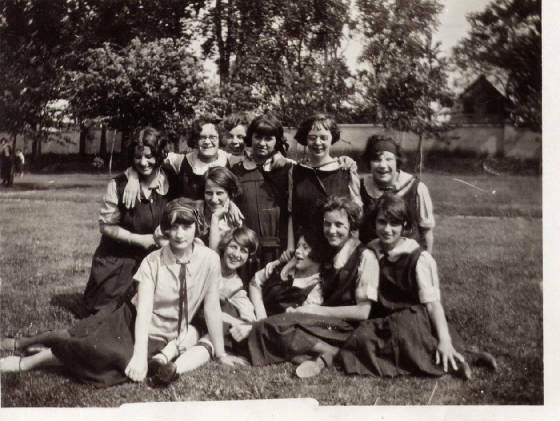 Along with the likes of Alvernia, Aquinas, Longwood, Loretto High, Loretto Academy, Mercy, St. Catherine (later known as Siena), St. Mary, St. Scholastica, St. Xavier, Visitation, and Evanston Marywood, these schools played each other until the Catholic Youth Organization formed its own girls' league in 1932.
goes out to Sr. Anastasia from the archives office at the Sisters of Christian Charity's Western Province office. In finding the following information as well as the images shown on this page, it would have not been possible to tell as much of the story about Mallinckrodt High School.